James was one of a group of Quakers who traveled to Canandaigua in 1794 to mediate the treaty between the United States and the Six Nations. He kept a journal of his travels, and excerpts were published in the academic journal Ethnohistory, Vol. 12, No. 4, Fall 1965, pp. 279-342. Here is a link to the published journal, but it requires a fee to view the full document, or access via a participating institution. The original journal is currently held by the New York State Library in Albany. 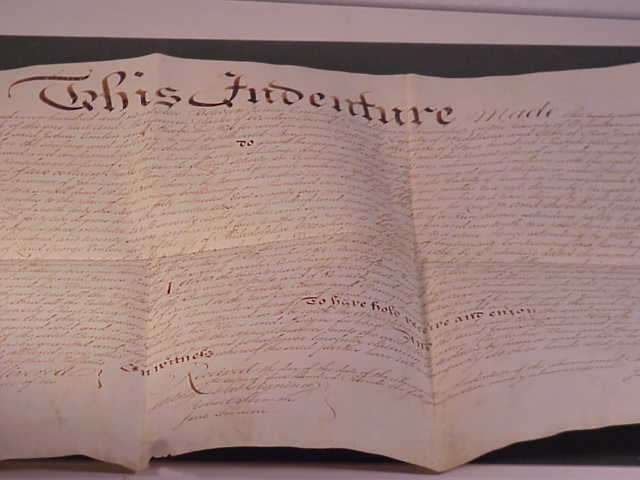 In 2000, a 1792 land deed between James Emlen and Benjamin Clarke was sold on eBay. From the description: "THIS INDENTURE Made the twenty-seventh day of March in the year of our Lord One Thousand Seven Hundred and Ninety Two Between James Emlen of Middletown Township in the County of Delaware and State of Pennsylvania, Miller, and Phoebe, his wife, of the one part, and Benjamin Clarke of Windsor Township in the County of Middlesex and State of New Jersey, Yeoman, of the other part Witnesseth...", and calls for "Four Hundred Pounds current Gold and Silver money of Pennsylvania" to be paid for Ground Rent on approximately 100 acres of land in Buckingham, PA. He was the son of George and Ann Emlen of Philadelphia, and born in that city in the year 1760. He was blest with an excellent understanding and a large capacity of mind, and was oftentimes, in early life, favoured to feel the precious influences of Divine love, operating to the enlightening of his understanding, and forming and establishing his judgment upon the principles of piety and a virtuous conduct. As he advanced in youth, his parents bestowed upon him a liberal share of school education, designing that he should travel to Europe for his further accomplishment in knowledge. But he, enlarging in acquaintance with the principle of Truth, and embracing a sentiment, that an increase of knowledge gained by traveling,—by dividing the attention, and too much diverting the mind from a steadfast pursuit of that which he found by experience to constitute its supreme good,—would be likely to add a proportional increase of inquietude and sorrow, declined the proposal, and retired to the country; where he sojourned a considerable time with a relation in New-Garden, Chester county. There he manifested to those acquainted with the operation of the Divine gift, that he had witnessed a degree of the holy communion, and a submission to the cross of Christ. Gradually laying aside the gayety of apparel he had before conformed to, and being now "transformed by the renewing of his mind," he embraced the ancient simplicity of the true believers, and united with the mildness of his disposition and evenness of his temper a remarkable circumspection in conduct, and manners; avoiding superfluity of almost every kind. The relation with whom he sojourned was Hannah Miller, then a widow, but who afterward became the wife of our beloved friend, Jacob Lindley. While resident in her family, as he greatly preferred being engaged in some useful employment to a life of in activity, he voluntarily assumed the charge of her flour-mill, then chiefly employed in the service of the neighbourhood as a grist-mill. To this service he diligently devoted his personal labours, without an assistant. His patrimonial property being plentiful, a desire to accumulate obtained no place in his mind. He therefore declined all pecuniary compensation for his services, only stipulating for the private liberty of manufacturing, without deduction of toll, the parcels of grain of some of his friends, whose circumstances he believed to be strait and difficult. In these cases his disposition led him to conceal from the knowledge of the left hand, what ever good the right hand might perform; and those acts of brotherly kindness became afterward known to individuals only incidentally. Being inclined to settle in the country, he was, in singleness of heart, desirous of being preserved from error in the choice of a settlement. In this state of humble desire to be rightly influenced and directed, a situation offered in Middletown, in the county of Delaware; with a view to which, his mind being perfectly at peace, he soon after purchased the property, and dwelt upon it the remaining part of his life. Feelingly sensible of the benefit of silence and frequent mental retirement, he generally avoided much conversation on subjects which did not appear to furnish present instruction; knowing that abundant expression, unaccompanied by experience and the approbation of the ever present Monitor, had a tendency to dissipate thought, and slacken that vigilant watchfulness over the "outgoings of the mind," whereby the christian's peace and strength are preserved. By reflections of this kind, he was impressed with much caution on turning his thoughts toward a matrimonial connexion, until he became acquainted with Phebe, the daughter of Caleb and Ann Peirce, of Thornbury; concerning whom he expressed, that "in company and conversation with her he felt the owning of Divine Providence, and esteemed and chose her because he discovered her to be more in substance than in show. In the year 1783, they be came united in marriage, and lived in endeared fellowship of spirit, and united harmony of social enjoyment, about ten years and a half. His connexions and great part of his estate remaining in Philadelphia, he was frequently solicited to return thither to settle: but, preferring the innocent employments of a country life for his rising family, he chose to continue in his retired situation, where portions of his time were frequently appropriated to their instruction, and teaching them the practice and use of silence. In a testimony concerning him prepared by Chester monthly meeting, of which he was a member, it is stated, that to his children "he was a very affectionate and tender parent, though firm in restraining them from undue liberties in dress, company, &c.—It being almost his invariable practice, when at home, on the afternoon of first-days, to have them collected about him, reading the scriptures of truth and other religious books, or exercising and improving their mental faculties;—feeling after and embracing proper seasons of silent retirement with his family, and for the expression of such counsel as impressed his mind under the power of Divine love." Some time after his marriage, he was appointed to the station of an elder in the church. This station he filled with much propriety—being a bright "example to the believers," and furnished with a discernment of spirit, whereby he was qualified to administer seasonable counsel and sound judgment.—His solid deportment and lively exercise for the resurrection of life in religious meetings, both for worship and discipline, being truly instructive and encouraging. In the year 1793, his beloved companion was removed from him by death. Being both of them under appointment to attend the Yearly Meeting as representatives, and an infectious fever prevailing in Philadelphia at the time thereof, it became a subject of much concern of mind to them. On this occasion, although he felt a choice in his wife's declining to attend, yet he left her to the exercise of her own judgment; which, after a season of attentive consideration, became decided to fulfil her appointment. On her being taken ill, after their return, he witnessed a severe conflict of the powers of his mind, before he attained to a perfect submission to the Divine will, in a prospect of the termination of her natural life. But as he earnestly sought for strength, he was favoured with a settlement in quiet resignation, his mind becoming mercifully clothed with a holy calmness, and filled with Divine consolation, in the enjoyment of a harmony and peace, which the unavoidable recurrences to his bereavement were never afterward permitted to disturb. Holding the cares of this world in due subjection, he devoted much of his time to the concerns of religious society, and frequently accompanied those who were engaged in the service of the Gospel, as a fellow-traveller in spirit, to meetings near his own neighbourhood, as well as several times to distant parts. As a member of the civil community, his disposition was eminently obliging and charitable; and his careful adherence to the Divine precept to "do unto others as he would be done unto," procured for him the high esteem of his neighbours generally. He was accustomed to consider the conclusion of a life well spent, as only a transition from the probations of a perilous pilgrimage, to a state of enlarged and established enjoyment. He therefore used to express, that "it was immaterial how short our stay was here, if we lived in the fulfillment of our duty, and were honestly careful to keep our daily accounts in readiness for a final settlement." 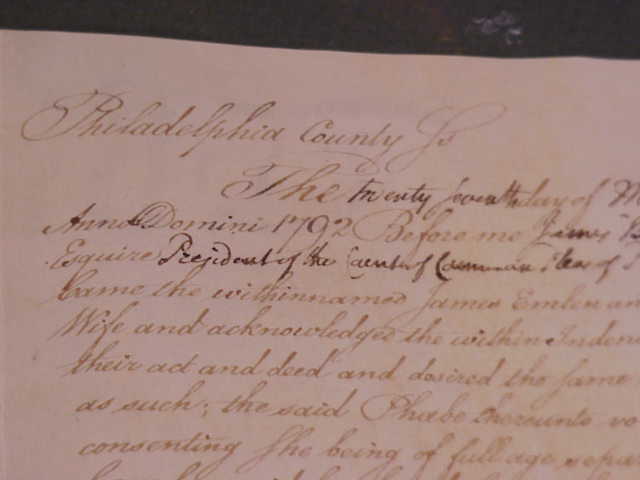 A pestilential fever prevailing again in Philadelphia in the year 1798, he believed himself bound in duty to attend with his friends, at the usual time and place for holding the Yearly Meeting, (which was the third time he attended under such circumstances.) As many of his friends in that solemn season of great mortality, partook of the common lot, in being suddenly removed from the field of probation, and considering himself as equally liable, he was engaged, before leaving his family, to make due provision for the settlement of his worldly affairs, and for the careful guardianship of his six children, all in their early minority. Although, by reason of the adjournment of the meeting, he returned home much sooner than usual, yet in a few days afterward, it appeared that he had received the prevalent infection. In the interval between his return and the beginning of his illness, the humility and sweetness with which his spirit was clothed, and which were conspicuously marked in his countenance and manners, seemed to be a confirming evidence to his friends who observed him, that his mind was redeemed from all undue attachment to perishing enjoyments, and witnessed a humble, holy communion with his Redeemer, the fountain of Divine purity and life. On being taken ill, he manifested entire resignation, and signified that his "reflections on having gone to the city produced him no sorrow." His mind was then so clothed with peaceful quietude, and replenished with heavenly enjoyment, that, as he expressed himself, he "felt not the want of the consolation of any earthly friend." His illness continued about eight days, a considerable part of which time his natural understanding was, by the force of disease, at intervals be clouded; yet it evidently appeared that the peace and composure of his soul were uniformly preserved. Thus "wisdom being his grey hairs, and understanding his length of years," his sun went down in brightness as in the meridian of common life. His departure to an unchangeable inheritance being on the 3d day of the 10th month, 1798, aged about thirty-eight years. James Emlen (George, George, George), born 6mo. 26, 1760, died 10mo. 3, 1798, of yellow fever; married, 4mo. 23, 1783, at Concord Meeting, Delaware county, Phebe Peirce, born 12mo. 11, 1758, died of yellow fever, 10mo. 25, 1793, daughter of Caleb and Ann (Mendenhall) Peirce. James Emlen, after his education was completed, declined to travel abroad, as his parents had intended, preferring to stay with his relative, Hannah, widow of William Miller, of New Garden, Chester county. "He assumed the management of her mill without an assistant and declined compensation, stipulating only that he might grind for some of the poorer customers without taking toll. In this, however, he was careful not to let the left hand know what the right hand did." He removed to Middletown in 1782, where he became owner of considerable land. Although but about thirty-eight years of age when he died he was an elder in the Meeting and served as clerk, recorder, etc. He was appointed one of the first standing committee to give attention to the condition of the Indian natives, and which committee, by successive re-appointments, has continued to the present time. Send me email using this contact form.